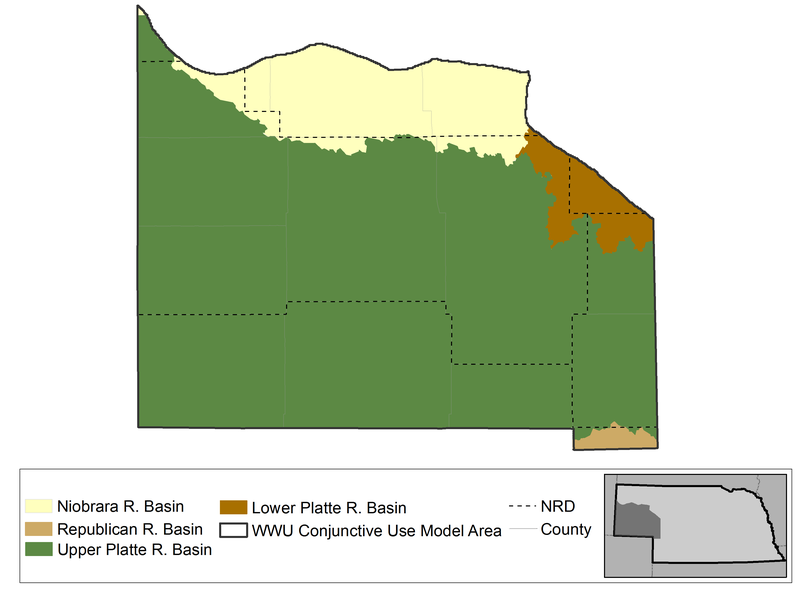 Originally developed in 1998 as part of COHYST (the Cooperative Hydrology Study), the COHYST 2010 Model and Western Water Use Model were later split into separate models because the geology, climate, and land management of the western reaches of the state were determined to be significantly different from those of the central part of the state. As shown in the figure above, the WWUM covers the Upper Platte Basin from upstream of Lake McConaughy to the Wyoming and Colorado state lines. While the original COHYST model was initially focused only on groundwater modeling, the WWUM now also takes surface water into account. Included in the final model are a surface water operations model, a groundwater flow model, and a soil-water balance model. These three models work in unison, producing hydrologic datasets to support water management decisions, especially in areas that have been determined to be fully-appropriated or overappropriated. The WWUM will continue to be refined as new input data (e.g., water losses from surface diversions and crop water use) become available. This model assists the Department and NRDs with meeting the objectives of local integrated management plans and the Platte River Recovery Implementation Program (PPRIP) by assessing the impact of water uses and management practices on long-term water supplies.